The WFCO T-30 transfer switch is designed to provide trouble free changeover of power between shore power and generator. The T-30-WM mounts easily on the wall or onto any flat surface. The WFCO T-30 and T-57 transfer switches are designed to provide trouble-free changeover of power between shore power and generator. 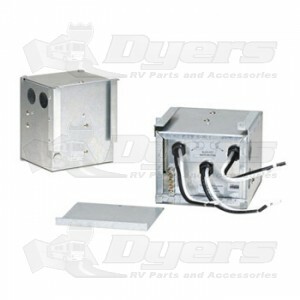 The T-57 is designed for 50-amp AC service, and the T-30 is used for 30-amp AC service.The T-30 can be installed on the back of a WFCO 8900 Series Power Center or like the T-57 it can be easily mounted to any flat surface. The compact design allows for placement in areas with limited space. Both transfer switches are engineered for safe, reliable performance.The DC coil in either unit prevents AC “chatter” noiseand drop-out in low-voltage conditions. Accidental coupling of power from or to shore line and generator is prevented by a “break before make” configuration.